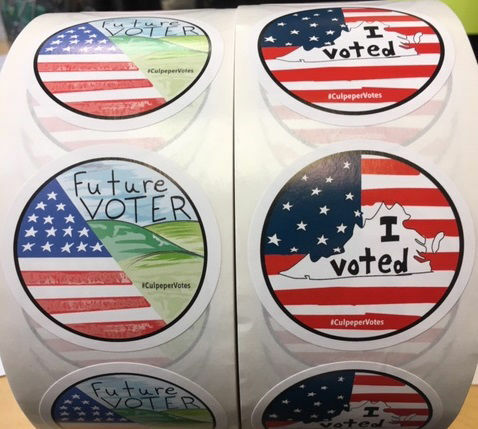 A pair of Culpeper County, Virginia, students designed the stickers voters and "future voters" will receive on Tuesday after they cast their ballots. WASHINGTON — When citizens cast their ballots in Culpeper County, like voters nearly everywhere, they’ll be given patriotic-looking stickers that read “I Voted.” But Culpeper’s stickers are extra special — they’re designed by county school kids. “To my knowledge this has never been done before in Virginia,” said Culpeper County Director of Elections James Clements. The Board of Elections already employs high school seniors as volunteers at polling places, but wanted to involve more students in the election process this year. So it held a competition, funded by the PATH Foundation, that asked 4th grade students to redesign the iconic “I Voted” sticker. High school seniors were asked to design a “Future Voter” sticker, given to children who accompany grown-ups to the polling places. “I had done the American flag in the back and Virginia in the middle,” said Natalie Nicholson, 9, of Farmington Elementary School. “I’m proud that everybody’s going to be wearing it,” she said. Culpeper County High School senior Jeffrey Maldonado won the design for the “Future Voter” sticker, featuring the American flag and the green hills of Culpeper County. With so much attention on this year’s election, they could be handing out an abundance of stickers on Election Day. “We’re staffing the precincts at what would be presidential election levels and we’ve basically ordered ballots to match,” Clements said.